Click on the links to print out the chess puzzles and to find websites and video clips with more help on playing chess. Online activities and websites to help you learn how each piece moves. Note: pawns can move one or two squares forward on their first move, then one square at a time after that. Instead of an army, think of each piece as a different kind of athlete. See pages 26-27 of your book for a handy reminder of how each piece moves. Some videos mention the names of the squares on the board. Click on the links in the topic "Writing down chess moves" to find out more. Castling allows your king to move two squares towards a corner for better protection. NB You do not need to purchase a membership to this site. The video provides a good explanation about pins. NB You do not need to purchase a membership to this site to watch the videos. Click on "Beginner" or type a chess term into the search box on the right. .
Each square on a chess board has a "name"
To follow a lesson and try a quiz, click on "The Chessboard: Lesson". Scroll down for simple quizzes to test your understanding. Ask an adult for help if you get stuck. Can you checkmate the enemy king? Click on "2 Rooks + King v. king" or "Queen + King v. king". See page 33 of your book and follow the "Checklist" to help you decide the best moves to make. Also see pages 34-35 for more about checkmates. You're white - can you figure out the next move? Don't worry if you make a wrong move. If you see "Try Again", click on the right arrow below this message to see the next move or click "Answer!" to watch all the moves. Time to play a game of chess! To play with a friend click on "Human" for the black player in the drop down menu. To try a different move, click on "Undo" at the top of the board. You need to sign up (it's free) to access these activities. Children - please ask an adult first. 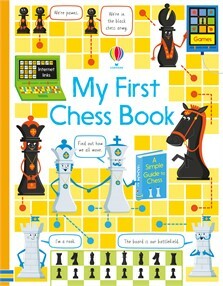 Learn how to command a chess army in this friendly introduction, with entertaining illustrations on how the pieces move, and tons of tips on attacking, defending and winning. A perfect starting point for young children – and a handy refresher for parents and grandparents! With links to specially selected websites with puzzles and more information.